At SurveyMonkey Intelligence, we have a wealth of insights on various key metrics from the U.S. smartphone app ecosystem. Today we’re diving into those insights to bring you these 13 app download statistics featuring some of the biggest numbers in the app market. 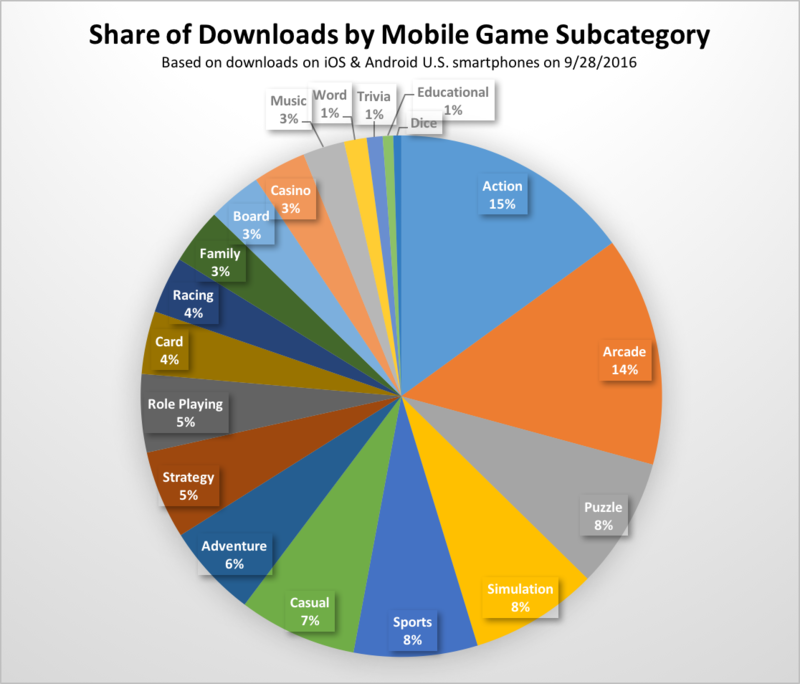 Mobile smartphone games got around 5.1 million total downloads on a recent day. 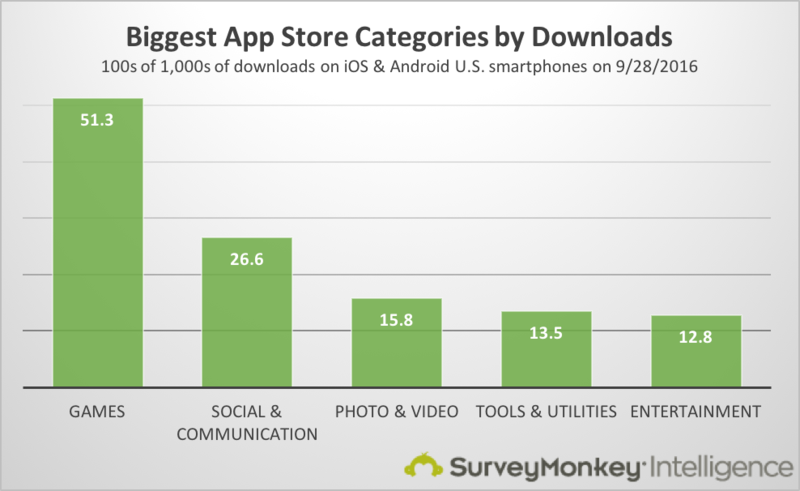 That’s almost twice as much as the next-biggest category, Social & Communication, which got 2.7 million downloads on that day. Social network apps like Facebook, Twitter, and LinkedIn claimed a little over a million downloads on a recent day, while messaging apps like Messenger, Kik, and Skype were just behind with 979 thousand total downloads. Action and Arcade games are by far the biggest sub-category of games in terms of downloads, getting 1.4 million and 1.3 million downloads on September 28, respectively. Puzzle games take up a distant 3rd place with 789 thousand downloads. Google is the biggest publisher of apps in terms of downloads, with its portfolio of 70 mobile apps getting 1.1 million downloads on September 28. Those apps are led by YouTube (152k average daily downloads in the past month), YouTube Music (112k avg daily downloads), Google Maps (123k avg daily downloads), and Gmail (67k avg daily downloads). 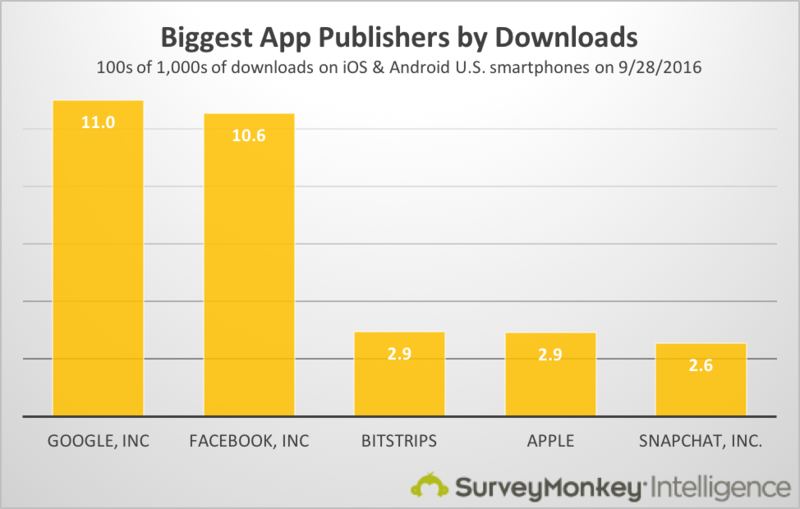 Meanwhile, Facebook, with only 13 apps in its portfolio, is right behind with 1.06 million downloads. Those 13 apps in Facebook’s portfolio are dominated by Messenger (348k average daily downloads in the past month), Facebook (262k avg daily downloads), and Instagram (246k avg daily downloads). Those three apps–a little of over 20% of the portfolio titles–account for over 80% of Facebook’s app downloads. 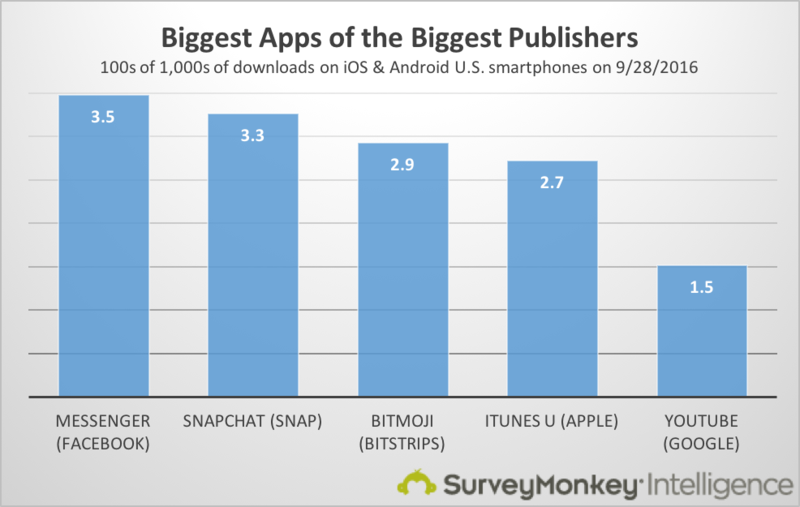 What about the biggest publisher with only one app in their portfolio? 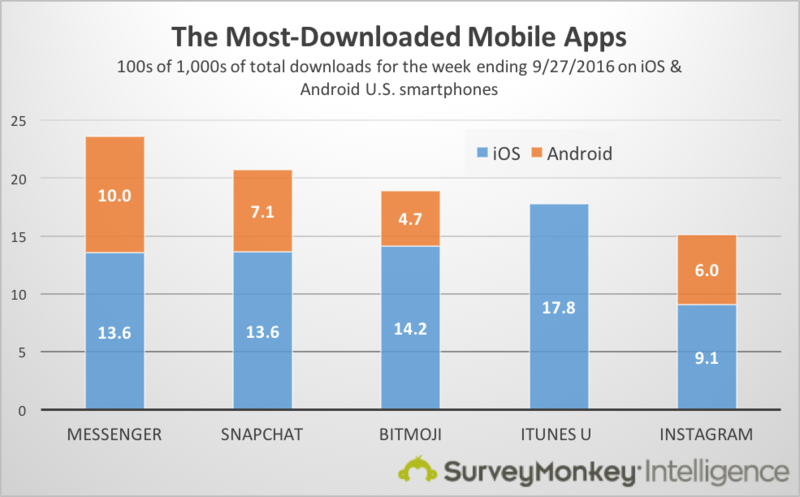 That’s Snap, Inc., whose one app, Snapchat, has gotten 327 thousand daily downloads, on average over the past month. The next-biggest one-app publisher is Bitstrips, whose Bitmoji app has netted 293 thousand downloads per day, on average. On both platforms, Facebook dominates, with three of its apps–Messenger, Facebook, and Instagram–claiming a spot among the top 10 downloaded apps. Facebook sits particularly pretty on Android, where those three apps account for three of the top four most-downloaded apps. 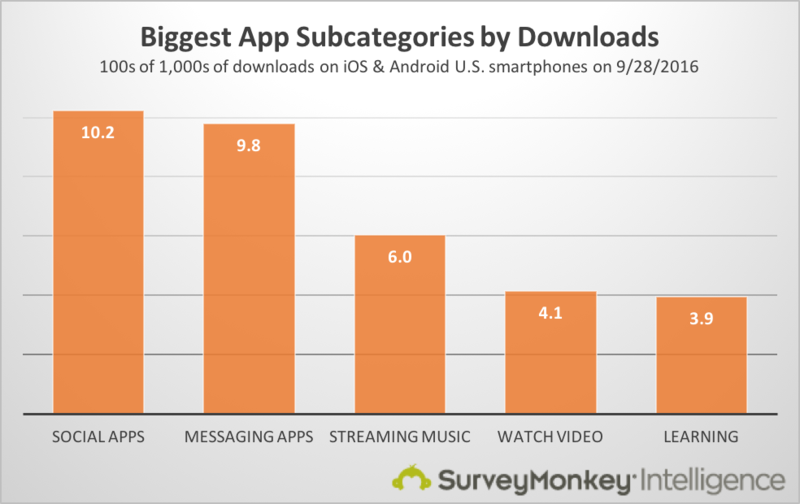 When considering all downloads from iOS and Android smartphones, the most-downloaded app is Facebook’s Messenger, with 23.6 million downloads during a recent one-week period. Messenger is also the most-downloaded app when only considering Android smartphones. Messenger’s 159 thousand average daily downloads from Google Play account for about 45% of Messenger’s downloads across both platforms. On iOS, the most-downloaded app right now is iTunes U, with 272 thousand downloads per day over the past month. What about Games, that huge app store category? The biggest publisher dedicated solely to games apps is Electronic Arts, with 175 thousand downloads of its games on September 28. In EA’s portfolio of over 30 mobile games, Madden NFL takes the lead with 33 thousand daily downloads, on average. The game with the most downloads right now has got to be Pokemon GO, right? Nope! 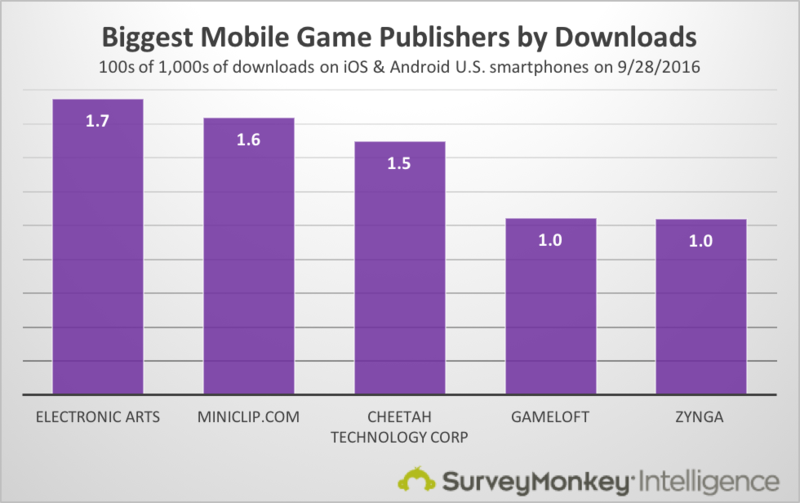 As of a few weeks ago, it’s a game called Rolling Sky from publisher Cheetah Technology Corp.
Rolling Sky has been on the rise, getting an average of 116 thousand downloads per day in the past month. 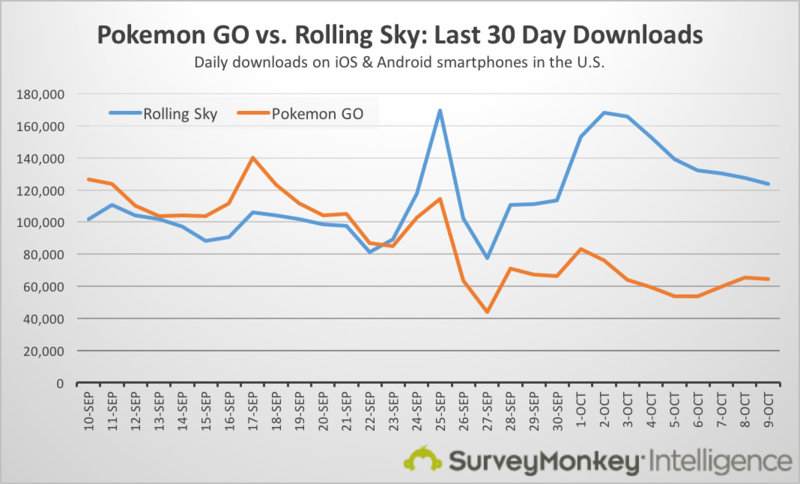 Compare that to Pokemon GO–currently the next-biggest game in terms of downloads–which has been on the decline and has been getting an average of 88 thousand daily downloads. Not too long ago, Pokemon GO was the most-downloaded mobile game by a large margin. During Pokemon GO’s record-setting launch month, it drove 12.2 million downloads on U.S. smartphones within 30 days. 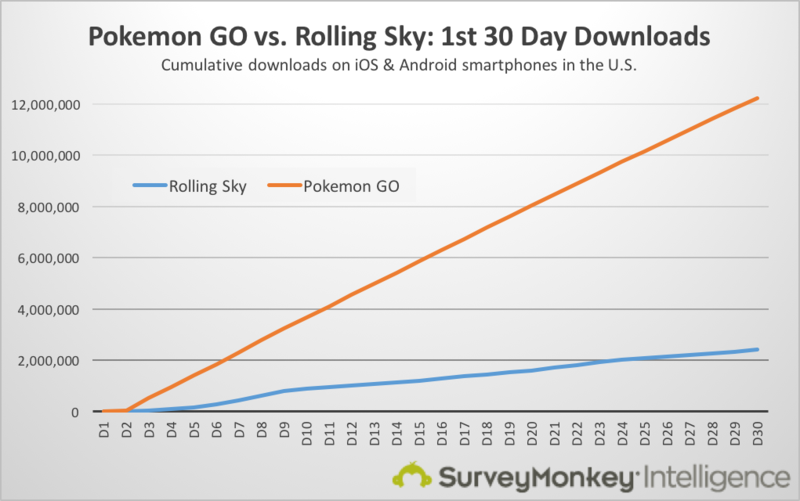 To put that in perspective: In its first 30 days, Rolling Sky got 2.4 million downloads. At that rate of growth, it would take Rolling Sky five months to get 12.2 million downloads. In reality, it took about seven months (210 days) for Rolling Sky to get over 12.2 million downloads in the U.S.. And that’s for a game that continues to top the mobile game charts. 14,285%. That’s how much Chick-fil-A increased their app downloads from one day to the next when they launched a free sandwich promotion to incentivize their customers to downloaded their mobile app. In May, the month leading up to the promotion, the Chick-fil-A app averaged just over 5 thousand daily downloads. The promotion, which started on June 1, quickly drove daily downloads to a peak of almost 400 thousand. Over the 11 days of the promotion, Chick-fil-a got 3.35 million total downloads. 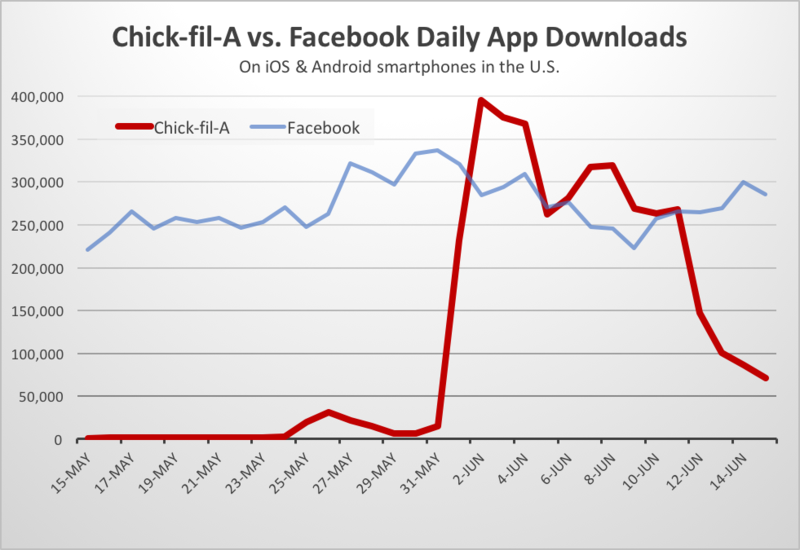 For a few days, Chick-fil-A even enjoyed more downloads than the Facebook app! This post originally appeared on October 13, 2016 on the blog of SurveyMonkey Intelligence, a provider of competitive intelligence for the mobile app industry. We’re the team that gets you free usage metrics for 1,000s of mobile apps, helping you discover insights and make better decisions.